U. CHICAGO (US) — The newly discovered fossil of a 165 million-year-old proto-mammal suggests that traits like hair and fur originated well before the rise of the first true mammals. Scientists describe the biological features of this ancient mammalian relative, called Megaconus mammaliaformis, in Nature. “We finally have a glimpse of what may be the ancestral condition of all mammals, by looking at what is preserved in Megaconus. It allows us to piece together poorly understood details of the critical transition of modern mammals from pre-mammalian ancestors,” says Zhe-Xi Luo, professor of organismal biology and anatomy at the University of Chicago. 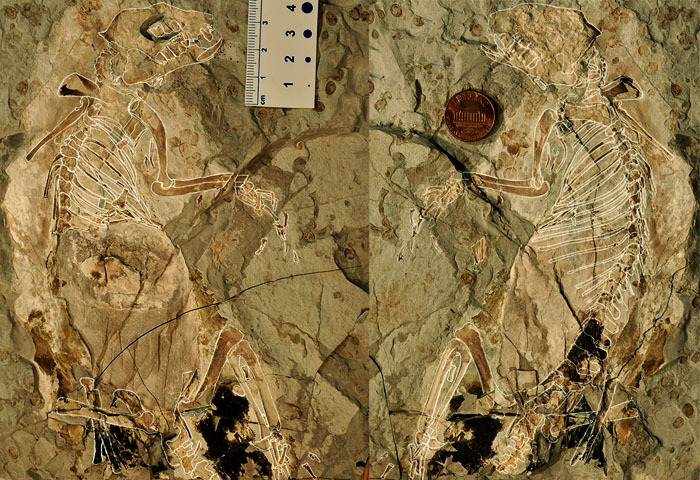 Discovered in Inner Mongolia, China, Megaconus is one of the best-preserved fossils of the mammaliaform groups, which are long-extinct relatives to modern mammals. Dated to be about 165 million years old, Megaconus co-existed with feathered dinosaurs in the Jurassic era, nearly 100 million years before Tyrannosaurus rex roamed Earth. A terrestrial animal about the size of a large ground squirrel, Megaconus was likely an omnivore, possessing clearly mammalian dental features and jaw hinge. Its molars had elaborate rows of cusps for chewing on plants, and some of its anterior teeth possessed large cusps that allowed it to eat insects and worms, perhaps even other small vertebrates. Bare belly & poisonous heels? It had teeth with high crowns and fused roots similar to more modern, but unrelated, mammalian species such as rodents. Its high-crowned teeth also appeared to be slow-growing like modern placental mammals. Preserved in the fossil is a clear halo of guard hairs and underfur residue, making Megaconus only the second known pre-mammalian fossil with fur. It was found with sparse hairs around its abdomen, leading the team to hypothesize that it had a naked abdomen. On its heels, Megaconus possessed a long keratinous spur, which was possibly poisonous. Similar to spurs found on modern egg-laying mammals, such as male platypuses, the spur is evidence that this fossil was most likely a male member of its species. 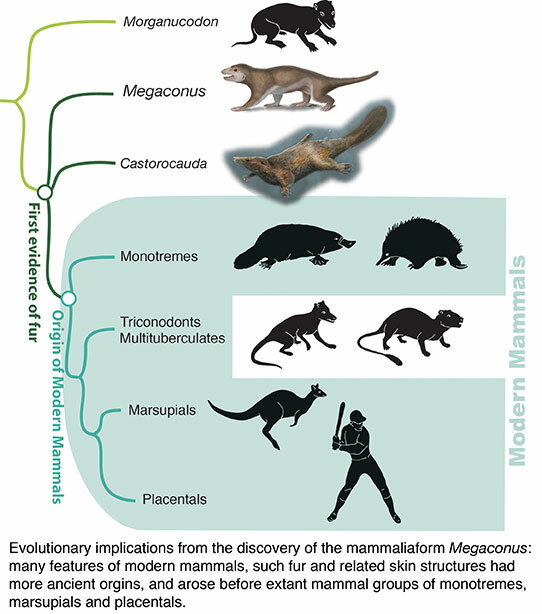 “Megaconus confirms that many modern mammalian biological functions related to skin and integument had already evolved before the rise of modern mammals,” says Luo, who was also part of the team that first discovered evidence of hair in pre-mammalian species in 2006. However, Luo and his team identified clear non-mammalian characteristics as well. Its primitive middle ear, still attached to the jaw, was reptile-like. Its anklebones and vertebral column are also similar to the anatomy of previously known mammal-like reptiles. “We cannot say that Megaconus is our direct ancestor, but it certainly looks like a great-great-grand uncle 165 million years removed. These features are evidence of what our mammalian ancestor looked like during the Triassic-Jurassic transition,” Luo says. “Megaconus shows that many adaptations found in modern mammals were already tried by our distant, extinct relatives. In a sense, the three big branches of modern mammals are all accidental survivors among many other mammaliaform lineages that perished in extinction,” Luo adds. Paleontologists from Paleontological Museum of Liaoning, University of Bonn in Germany, and the University of Chicago discovered and studied the fossil, which is now in the collections in Paleontological Museum of Liaoning in China. The Key Lab for Paleobiological Evolution of Northeastern Asia, Ministry of Land Resources of China, Shenyang Normal University, Paleontological Museum of Liaonig, German Research Foundation (Deutsche Forschungsmeinschaft), Alexander von Humbolt Foundation, the National Science Foundation, and the University of Chicago funded the research.